CHARLESTON, W.Va. – Supreme Court Justice Menis Ketchum announced his retirement today, July 11, 2018. “I have decided to retire and relinquish my office as a Justice of the West Virginia Supreme Court of Appeals. 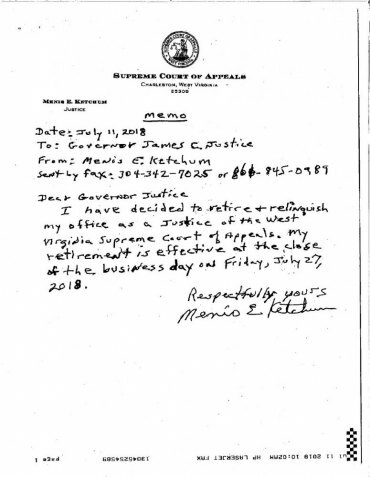 My retirement is effective at the close of the business day on Friday, July 27,” Justice Ketchum wrote in a two‐sentence letter to Governor Jim Justice. Governor Justice sent Justice Ketchum a letter accepting the resignation and thanking him for his public service. Justice Ketchum said he would have no further comment. “I have directed my general counsel to provide the necessary documentation to the Judicial Vacancy Commission and other state agencies as may be appropriate to fill this vacancy created by Justice Ketchum’s resignation,” Gov. Justice said. Since Allen H. Loughry II has been suspended pending outcome of a federal indictment, the state's highest court now has three justices. Ketchum had been mentioned in documents where court renovations soared nearly two million dollars over budget, he had driven a state vehicle between Charleston and his home in Huntington. In addition, he neglected to pay for a clock purchased by Justice Larry Starcher. When brought to his attention, he paid the state the full book value of the item. Justice Ketchum was elected to a full twelve‐year term on the Supreme Court on November 4, 2008. He served as Chief Justice in 2012 and 2016. Justice Ketchum was born in 1943 in Huntington, West Virginia, and was raised in Wayne County. He was educated in Wayne County public schools before attending Ohio University in Athens, Ohio, where he played varsity baseball and was a member of the 1964 Mid‐American Conference Championship Baseball Team. Justice Ketchum returned to West Virginia to attend West Virginia University College of Law. While in law school he was a contributing writer and associate editor of the West Virginia Law Review. He received his law degree in 1967 and returned to Huntington to join his father, Chad W. Ketchum (1911‐1998), in the practice of law with the firm of Greene, Ketchum & Baker. He practiced at that firm and its successors, eventually becoming the senior partner, until his election to the Court. Justice Ketchum's law practice included insurance defense, personal injury, and criminal defense. He was recognized continuously from 1989 to 2008 in The Best Lawyers in America and was a member of the Leading Honoraries, the American College of Trial Lawyers, and the American Board of Trial Advocates. Throughout his legal career he published legal articles and presented numerous continuing legal education seminars. Justice Ketchum also served as a member of the Board of Governors of Marshall University from 2002 until his campaign for the Court, and served as Chairman or Vice‐Chairman of the Board from 2003 until 2008. At the time of his election to the Court, he served on the Boards of the Public Defender Corporations for the Sixth and Twenty‐Fourth Judicial Circuits. He previously served on the Huntington Urban Renewal Authority, participated in the statewide Vision Shared Health Care Team, and the Governor's Mine Safety Task Force. Justice Ketchum has been married to the former Judy Varnum since 1966. They have three children – Kelli Morgan, Bert Ketchum, and Chad Ketchum – and six grandchildren.